Located in a residential area of the Budapest's 8th district in a renovated 19th-century historical building, Harmonia Palace Apartment offers modern apartments with free WiFi, just 50 metres from the National Museum. The colourfully decorated air-conditioned apartments feature hardwood floors, a fully equipped kitchen, a bathroom with a bathtub or a shower and a patio. Restaurants and grocery shops can be found within 300 metres and the Great Market Hall is to be found 600 metres away. The Vaci street, one of the main pedestrian thoroughfares, is a 2-minute walk away. 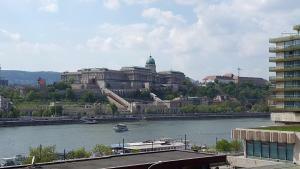 The Buda Castle can be visited 2.6 km from Harmonia Palace Apartment and the Gellért Bath can be sightseen 1.2 km away. The property has a good public transport connection, the Kálvin tér Metro Station and Tram Stop are located 150 metres away and the Harminckettesek tere Tram Stop, offering non-stop transport service, can be found 600 metres off. The Liszt Ferenc International Airport is 16 km away. Private parking is possible on site. When would you like to stay at Harmonia Palace ? 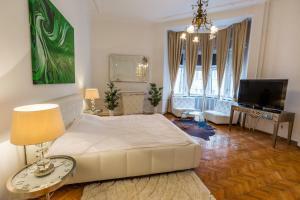 Air-conditioned apartment with a fully equipped kitchen including a dishwasher. The unit features intarsia hardwood floor, stucco, and 5.2-metre-high ceilings. Guests can find free tea, coffee, sugar and salt in the kitchen. 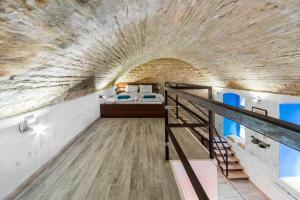 Air-conditioned apartment with a fully equipped kitchen. The unit features intarsia hardwood floor, stucco, and 5.2-metre-high ceilings. Guests can find free tea, coffee, sugar and salt in the kitchen. This soundproofed apartment is fitted with parquet flooring and crystal chandeliers, and it comes with a roofed terrace, a well-equipped kitchen and a bathroom with a bathtub and a hairdryer. This apartment is fitted with parquet flooring and crystal chandeliers, and it comes with 2 balconies, a well-equipped kitchen and a bathroom with a shower and a hairdryer. This apartment is fitted with parquet flooring, christal chandeliers and it comes with a roofed terrace, a well-equipped kitchen and a bathroom with a shower and a hairdryer. This apartment features a toaster, microwave and stovetop. This apartment has a electric kettle, dining area and kitchen. This property will not accommodate hen, stag or similar parties. Please note that check-in after 21:00 is possible for an additional fee of EUR 25. Each day we'll check prices and send you an email for your selected dates at Harmonia Palace. If you don't have specific dates but would like to check prices for say next weekend or say next month we can check the price too. Click to write a review and share your experience of Harmonia Palace with other travellers.